Preston University’s Placements Office in collaboration with UBL Fund Managers arranged On-Spot Interviews and information desk for students on 22nd March 2018. Viva Voce/Public Defense of PhD (Management Sciences). Seminar on United Nations Security Council Kazakhstan Chairmanship organized by Institute of Peace and Diplomatic Studies & Embassy of Kazakhstan was held on January 23, 2018 at Preston University, Islamabad Campus. Preston University organized 4th Intra-staff/faculty Cricket Tournament in collaboration with Eventie (Event Sponsors) on 7th January 2018. Preston University organized an Intra Naat Competition on account of “Rabi-ul-Awwal” Eid-e-Milad-un-Nabi (S.A.W.W) on Thursday January 4, 2018 in Preston Auditorium. Debates/Declamation Contest was held on December 27, 2017 in connection to the Birthday Anniversary of Founder of Pakistan Quaid-e-Azam Muhammad Ali Jinnah observed on 25th December 2017. Seminar on promoting disability awareness on theme “Transformation towards sustainable and resilient society for all” was held on Friday Dec, 15th 2017. BELIEVERS Life Skills Trust (BLST) ( a non – government organization) working for character building of society through Life Skills(especially in Youth) organized a session at Preston University on Dec 13, 2017. All the Mid-Term Examination which were not held on 25th Nov, 2017 & 26th Nov, 2017 will now be held on Saturday, 9th December 2017 & 10th December 2017 respectively, as per the previous time slot. All the Re-Sit Examination which were not held on 27th Nov, 2017 will now be held on Saturday, 9th December 2017 as per the previous time slot. Preston University will remain closed on Friday December 01, 2017 on account of Eid-e- Milad- un –Nabi (S.A.W.W).The university will reopen on Saturday December 02, 2017. It is to notify that all the mid-term papers of BS-Tech/B-Tech (Hons)/M-Tech will be held on Saturday December 02 & Sunday December 03, 2017 as per the previous schedule. As per the decision of Preston Management and Registrar all papers and classes scheduled for November 27, 2017 are postponed and the university will remain closed. As per the directives of Chancellor Preston University all papers and classes for today November 25, 2017 are postponed. New date will be announced in the next week. As per the directives of Chancellor Preston University all papers and classes to be held on Sunday, November 26, 2017 are cancelled. The new date for the mid term paper will be announced in the next week. Preston University marks 140th Birth Anniversary of eminent Poet-Philosopher and great Politician Ideologist/Activist Dr. Allama Muhammad Iqbal. Preston University makes history by winning 1st Position in All Pakistan Inter university Urdu Declamation Contest for All Allama Iqbal Shield organized by HEC. Information Seminar organized by MIGRANT Resource Centre. Weekly FACULTY ACADEMIC FORUM-LECTURE SERIES-8., PRESTON UNIVERSITY KOHAT ,Islamabad campus was held on 11th October, 2017. Weekly FACULTY ACADEMIC FORUM-LECTURE SERIES-7., PRESTON UNIVERSITY KOHAT ,Islamabad campus was held on October 4th October, 2017. Weekly FACULTY ACADEMIC FORUM-LECTURE SERIES-5., PRESTON UNIVERSITY KOHAT ,Islamabad campus was held on September 13, 2017. Re-Sit Results Fall Quarter 2016 - Islamabad/Lahore/Faisalabad/Peshawar and Kohat Campuses has been announced. Terminal Results of B-Tech Program Fall Semester 2015 - Islamabad Campus has been announced. Terminal Results Summer Semester 2016 - Islamabad/Peshawar/Kohat/Lahore and Faisalabad Campuses has been announced. Terminal Re-Sit Results Summer Semester 2016 -Islamabad Campus has been announced. Terminal Results Summer Quarter 2016 -Islamabad Campus has been announced. Terminal Results of EMBA/MBA/MCS/MSc and DDRM Program Fall Quarter 2015 - Islamabad Campus uploaded to the web server. 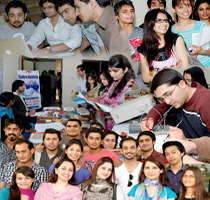 Preston University Clinches 2nd Position in "Youth Declamation Contest"
Prestonians Outsmart their Counterparts in Inter-university Competitions held at "Express Education and Career Expo 2015"
Preston University organizes "Entrepreneurial Challenge 2015"
Preston University Organizes Inter-university "Sports Gala"
Preston University organizes Inter-university "Drama Competition"
Preston University Wins "6th RCCI Business Plan Competition"
Preston University and Jump Start Pakistan Jointly Organize Seminar on "Entrepreneurship"
Preston Organizes Launch off Dr. M. Rashid Seyal's Book "Faith in the Unseen"
Prestonians Steel the Show at "Express Education and Career Expo 2014"
Prestonians Grab 2nd Position in "All Pakistan Inter-University and Inter-Collegiate Quiz Competition"